Här kommer en nyhet som kan göra det lättare att åka till England. Sugen på att åka Morgan i Skottland? Vår utlandssekreterare fick tips om möjligheten att hyra en Morgan läs mer här…. 10 % rabatt för förstagångshyrare. Möjligheten att åka containerbåt från Göteborg till Immingham verkar nu att vara helt borta (se nedan). Travel limitation for private passengers DFDS freight port of Immingham can accept commercial freight drivers with their loads. Due to UKBF port approval private passengers are not permitted to be carried through Immingham, this means that we can no longer accept leisure fare paying passengers on the freight routes through Immingham. Leisure passengers should refer to our passenger ferries section on the website for details on our passenger services. 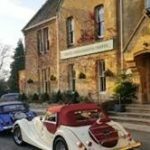 Are you in need of inspiration for new places to visit in the UK with fellow MSCC members next year? Maybe we can help. Three Ways House is set in the picturesque Cotswold Village of Mickleton, Gloucestershire. 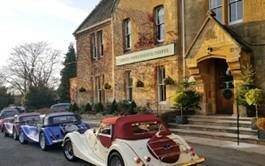 It’s a great spot for overnight stays, a pit stop for lunch to include our famous Pudding Buffet, or for afternoon tea with Sheila’s scrumptious scones! Three Ways House is just 10 minutes away from Stratford upon Avon and 5 minutes from Chipping Campden. Whilst the Morgan Motor Factory is a very pleasant 45 minute drive away. Prescott Hill Climb is pretty close too, it’s only 30 minutes away. Their calendar of events for 2018 includes the VSCC weekend on the 3-4 August. We have 48 bedrooms, an AA Rosette Restaurant, private dining and Randall’s Bar, serving a good selection of ales and sensibly priced wines. Oh, and yes we have a car park where your cars can be safely parked.